Its the end of another month and it's that time again to update you with what I think of this month's birchbox after trying it out before the September box comes. Disclaimer: I subscribed to Birchbox with my own money and all my reviews here are real and true. Honestly, I am not impressed with this month's theme of "Back to School" box. 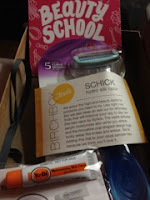 The Schick Razor that was an extra in this month's box would have been more useful in the beginning of the summer since duuh! its beach season! I'll still thank you for it since that's one less thing I need to stock up on now. - LashFusion XL Mascara: I have never heard of this product and was excited to see a lot of good reviews on it online. Personally though, I really don't see any wow-factor compared to my Shiseido mascara. It didn't hold my curl, I had to recurl my lash after putting it on, but I really didn't see any added volume or length to my lashes. - Viva La Juicy La Fleur sample perfume: I love this scent! It's light and sweet and a little bit floral. But again this would have been a nice scent to wear during the summer, not in the end of summer! I'd still wear it when I do my weekend morning errands because its a good wake-me-up scent with my cup o'latte in hand. - Yu-Be Moisturizing Skin Cream: I used this on my dry toe cuticles (not sure if that's a real term) since all that sandal wearing all summer really dries up my toe cuticles, and it works! The menthol smell goes right away as what the paper that came with it say and it's not as greasy as it looks. It may remind you of vaseline petroleum jelly but it is not the same consistency. My skin absorbs it right away and I can go back to texting or to my iPad and not leaving greasy finger marks on the screen. I tried it on my lips but its not moisturizing enough for me. So if you're looking for a non-greasy cream for dry skin, this totally works! - Shu Uemura Cleansing Oil Shampoo: I got one packet of this and to give you a review after just using it once is not a true opinion for me on what I think of the product. I only have a Shu Uemura lash curler so I really don't know how his hair products are either. I suggest to read reviews online before buying this product. There's no harm in doing a little bit of research before buying any products peeps so take a few minutes and Google instead of impulse buying. Hopefully the September Birchbox will have more exciting products since it is the Fashion month so I have learned after watching "The September Issue".